I really love to photograph the world around me. It’s yet another way to tell the stories that I constantly see floating around in my day-to-day. They are also incredible reminders of times past, for better or worse. I honestly can’t remember a time when I didn’t have a camera at my disposal. When everything went digital, my instances of taking snapshots went up significantly. But when my phone became my go-to camera? That’s when the game changed completely. The ability to take great quality shots from something I carry with me pretty much all the time, was what changed me from a part-time “planned moment” photographer, to a full-time one. Am I a professional by any means? Hell no. I am more of a hobbyist really. But I do love it and with each composition, I notice my eye getting better and my shots more interesting. For the last couple of years, I have been using whatever version of the iPhone I owned at that time. I love the shots it takes and with the plethora of image manipulation apps at my disposal in the App Store it gives me a lot of opportunities whenever I find inspiration. But there comes a time when you can feel you are reaching the limitations of the hardware at your disposal. Not that you want to abandon it completely, but that you simply wish you could somehow ”do more” with it. When you reach the point I mentioned above, you have a few options. You can always upgrade to more powerful kit. Maybe a more powerful point-and-shoot? Maybe a gorgeous DSLR? But that’s yet another thing you have to carry around with you and it can also get expensive; not all of us have hundreds of dollars of disposable income. Wouldn’t it be great if there was something in between? Something that didn’t let you sacrifice your current situation (that camera that’s always in your pocket), but also gave you new avenues allowing you to expand upon what already works? That’s some pretty cool extra functionality and while I’ve only been using it on my iPhone 5 for a few months now, I am already loving the results that this tiny lens kit provides. I particularly love the macro capability and am astounded that my phone can produce such shots. My second favorite is the fisheye, which has afforded me some neat artistic license, and while I haven’t used the wide-angle much, it’s definitely been handy when I’ve wanted to capture the horizon (while not doing a panorama). What’s also fun is using these lenses while shooting video! You can create some pretty funky stuff if you feel so inclined! The first thing you notice when you unpack the ōlloclip is that, despite it’s weight, it feels rugged. The clip part of the lens kit that is attached to the iPhone itself is a kind of soft plastic that, at first, had me worried about scratches on the front and back body of the phone. But, after using it for a bit, it is clear that it’s the soft build of the plastic that insures a tight fit on the phone, all the while protecting it. The glass itself is housed in a rugged anodized aircraft grade aluminum that feels rigid, yet incredibly light weight. The glass (arguably the most important part) is “precision ground glass multi-element optics” and while I am far from being a lens expert, I have been very pleased with the quality they produce. They each come with their own lens caps and the lenses themselves are also really easy to clean. The kit itself comes pre-assembled with a tiny pouch that doubles as a handy lens cloth. I keep the whole kit in my breast pocket of my jacket or in my front pants pocket if it’s warmer. It’s so light that I hardly can tell its even there. Oh and if you are a traveler and are into light-weight minimalist systems, this will definitely help in that regard. I can’t wait to take this on my next trip anywhere. As tiny as the kit is, it is oddly shaped. So my only wish really, is that I could take the entire assembly apart and somehow still protect the lenses from damage. In its current state I don’t really see a way to do that. But, as I stated above, you don’t really feel it in your pocket unless you bump into a wall or something and it jabs you. Also, because of its size, I do worry about breaking it. I can’t help it. It’s not that it feels fragile or anything, it’s just that I personally can be really clumsy and, depending on the day, absent-minded. So it wouldn’t surprise me at all if I dropped it or sat on it some day. But again, as I stated above, the build quality is such that I have yet to feel that this little power-house would go down without a serious fight. A lot of these have been run through filters (you can tell which ones I am sure), but while I am no pro, I still am stunned that these were shot with an iPhone. At $69.99 I can heartily recommend it for folks looking to take their iPhone photography to that proverbial next level. It’s super easy to use and once you get the hang of it, I think you’ll be just as amazed as I’ve been! 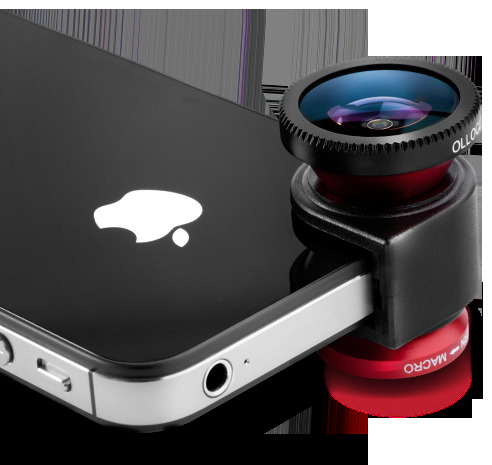 Please Note: The pics in this review of the ōlloclip itself, are all linked from their site. I did not take those (though I wish I did). Thanks for the recommendation! Now where can I get it! ?